Custom tailored to professional farming applications, Krone's new generation of Swadro rakes feature new Lift tines with crooked ends that effectively lift the crop off the ground (Krone Lift Effect) and thus minimize the risk of contamination and substantially improve the quality of forage. Each tine arm drags four of these 10.5mm tines that are mounted to it by three coils so not a single tine is lost. Another user friendly detail on all new Krone Swadro models is the machine's max. 4m transport height which is achieved without removing the tine arms, meaning the machine travels quickly and without hassle between fields and without the operator having to leave the cab. Another highlight about the new generation of rakes is the extra rotor in the middle of the machine, an option that is available on the new centre-delivery TC 680 and TC 760 models and the comfort version TC 760 Plus. 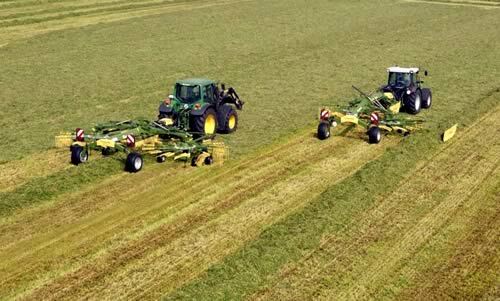 Raking those areas where the rotors place the swath, the extra rotor is particularly useful in leafy crops such as lucerne and in hay, enhancing a uniform wilt inside the swath. The rotor features parallel lift control for perfect ground contour following and is lifted out of work by the hydraulic lift-out system, coming to an instant and automatic halt the moment it lifts out of work. Lift height, too, is impressive on the new rakes. The new side delivery rakes are raised up to 50cm clear off the ground for smooth headland turns. In addition, all side delivery rakes feature the well-proven technology that has the leading rotor rotating at higher speeds than the others, preventing roping and ensuring greater efficiency and throughputs by the following harvesters. Another exemplary detail is the scale and stepless depth control down to the millimetre – either manual or electric, leading to cleanest rakes. Electric control is an option that is implemented by the use of the well-proven servomotors. A new detail here is that the tractor driver can now alter and read the current setting from the seat. All these new features are implemented to technology that has proven its worth thousand and thousand of times. For example, the maintenance-free rotor gearboxes have heavy-duty and unlubricated Duramax cam tracks, which come with a 3-year warranty. These gearboxes from Krone’s modular system are used on all rakes, from the single-rotor model to the Swadro 2000 flagship. Also, the tine arms run in sealed races and require no lubrication at all, and the Krone 'Jet-Effect' is taken over from the previous models. By shifting the rotor's centre of gravity this technology raises the leading end of the rotor first, preventing the tines from scratching the ground as it lifts out of and lowers back into work (cardanic suspension). Summary: Krone's new generation of rakes are a clear statement of how to update proven technology in an intelligent way. A special feature about the new Swadro models are the crooked Lift tines which provide cleanest rakes and hence higher workrates – also for the following harvesters.